Craig Donaldson is a current student at Prince William Sound College. After a 30-year career in emergency medical services, he is pursuing an undergraduate in occupational health and safety. Prince William Sound College (PWSC) Archery Club’s ninth annual Vegas in Valdez Archery (ViVA) Tournament takes place on March 21-24, 2019, in Valdez, Alaska. Listen to the Sound and Valley report on Chancellor Sandeen's recent visit to Valdez. Reported on by Shahmeer Azmat. Saje Pernie is a recent graduate of PWSC. She earned an Occupational Endorsement Certificate in Millwright in May 2018. We interviewed her to find out what she is doing now that she has completed the program. We discovered that she now works for Hess Corporation in North Dakota and earns a whopping $210,000 per year! 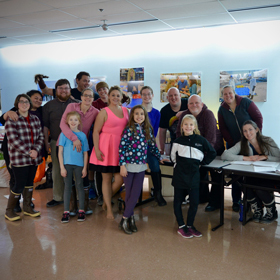 Prince William Sound College’s Copper Basin Extension Center (CBEC) hosted their annual Open House and Community Dinner as a part of the events associated with the Copper Basin 300 Sled Dog Race. Rent a pair of cross-country skis from the Health and Fitness Center for free! Congratulations to the students who received high grades this past semester. Four new certified Emergency Trauma Technicians are now in Valdez thanks to George Keeny's class! Read More PWSC's fall theatre production "If..."
PWSC's fall theatre production "If..."
The fall theatre production, "If....", is an original play for children written by Valdez residents. There will be a school matinee on Friday, November 16, at 10:00 a.m., with public showings that night at 7:00 p.m. at the Valdez Civic Center.